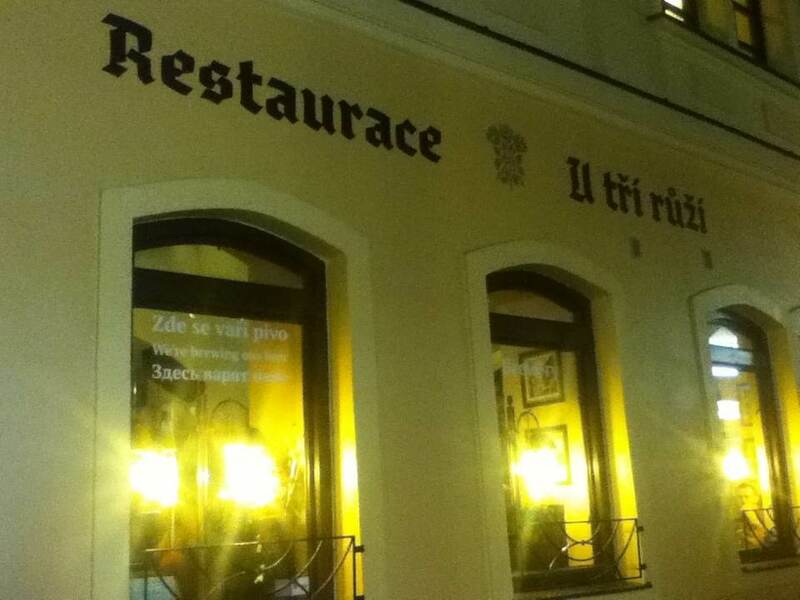 U Trí Ruzí, aka The Three Roses was not only a “Restaurace” but a brewery. Finally! Beer! After middling Czech wine. We saddle up to the bar. Copper, stained wood, and old lamps paint the place as a slightly steam-punk, yet modern and comfortable joint. It is slightly hazy (odd), medium amber colored with a cream colored lace. The beer smells clean, with medium intense orange spice, and light malt. The palate feels dry, with medium acid, medium hoppy bitterness, medium body, and a snappy texture. Flavors are unexpectedly strong with fresh oranges, cut wheat, nutmeg, and rye bread that last a medium plus length. Very good (4 of 5). Our second dark lager this trip. Guinness Black Lager in Ireland was decent. 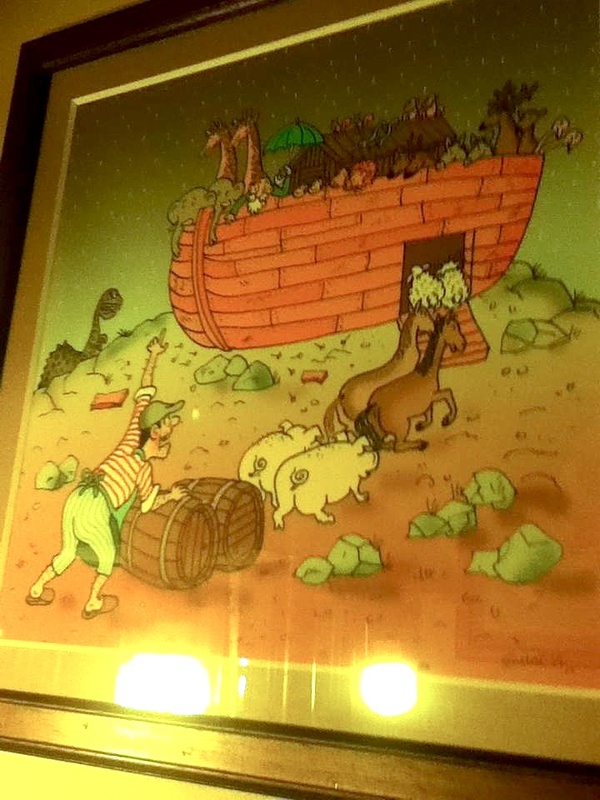 But if this one is anything like Three Roses’ earlier lager, I should not worry. The color was a concentrated red amber, with a coffee-colored head. Aromas smelled moderately of pleasant fresh manure, black coffee, rye, and caramel. The dry palate had a twinge more bitterness, alcohol and body than it’s clear cousin. The texture felt punchy yet creamy. Also stronger flavors of peat smoke, char coffee, black licorice, caramel, and hoppy grapefruit came up and lasted a medium plus length. Very good (4 of 5). Next, their Vienna Red: a style we missed in our wine-focused time in Austria. Again, clarity is not their concern with this amber red, with thin fine, off-white lace. Aromas glowed moderately of caramel malt, red apple, and dried grass. Acidity and bitterness were low here, but 6% noticed as was fuller body. Flavors of mixed nuts, almonds, caramel, and oranges had presence and length. Again, consistent and Very Good (4 of 5). Fed and full, we considered to go home by now. But the ambiance was pleasant, the holidays were near, and a Christmas Amber was on tap. Again appearances look hazy, intense red amber, with a cream colored head. Aromas smell moderately of raspberry, caramel, unbaked dough, and rose. The palate feels dry, low in acid, hardly bitter, but warm in alcohol (6.5%) and full in body. Flavors taste fruity and moderately of red fruits, red grapefruit hops, warm caramel, and shortbread lasting a medium plus length. 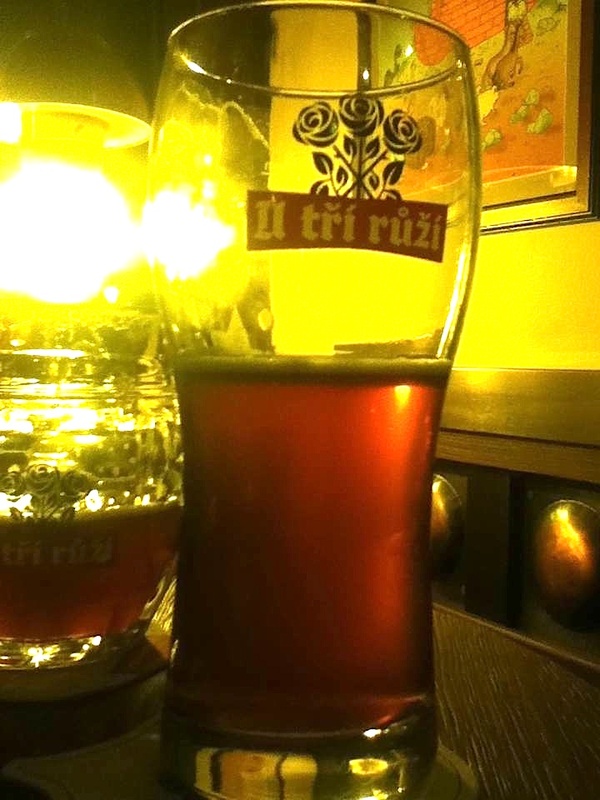 This is a mellow, plump, very good beer (4 of 5) made from 2 Czech hops and 4 malts. A clear amber is capped by a white head. Aromas smell powerfully of honey, golden apple, and cinnamon. This is fruit forward beer, with medium acid and bitterness, the high alcohol makes for medium plus body, with a frothy, creamy texture. Flavors pound out orange, apple, hoppy grass, honey, that lead to a lightly bitter, wheat finish of medium plus length. Very good (4 of 5). Great balance. 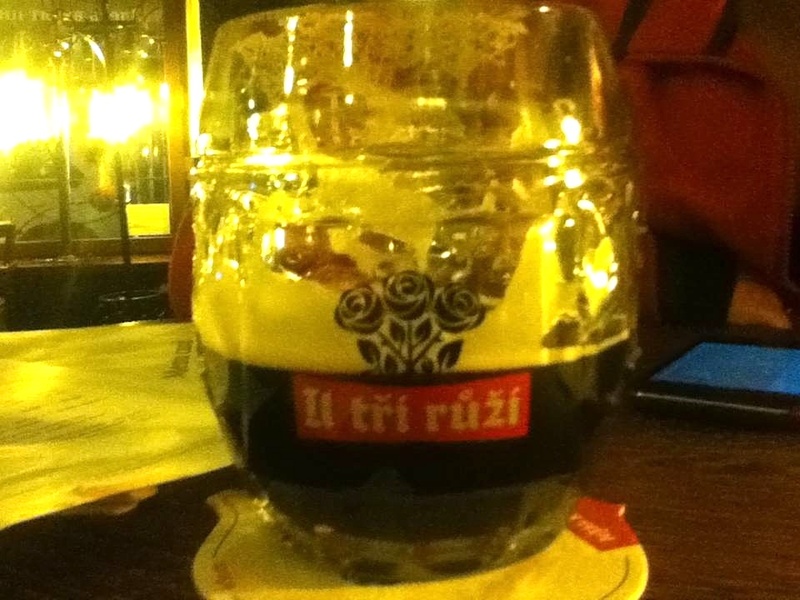 For only $1.50 (39Kc) we fill a .30l glass of U trí rûzí, Weiss Bock, Prague, Czech Republic. The appearance is hazy, amber, and laced white. Exotic, rich aromas of orange peel, lemon juice, and wheat toast with butter float up. The dry but fruity palate shows high, balancing medium plus acidity, medium minus bitterness, oodles of alcohol (7.5%), a medium body that feels snappy but round. Medium flavors of fresh squeezed oranges, cardamon, and clove lead to a green, vegetal, hoppy finish that lasts a medium plus length. Their Weiss Bock is outstanding (5 of 5) in the fact that it remains refreshing, even with all those fruit esters and alcohol. Overall, The Three Roses straddles modern beer styles, while feeling firmly centrally European. The prices were fantastic. The beer consistent and very good. And the space was inviting. 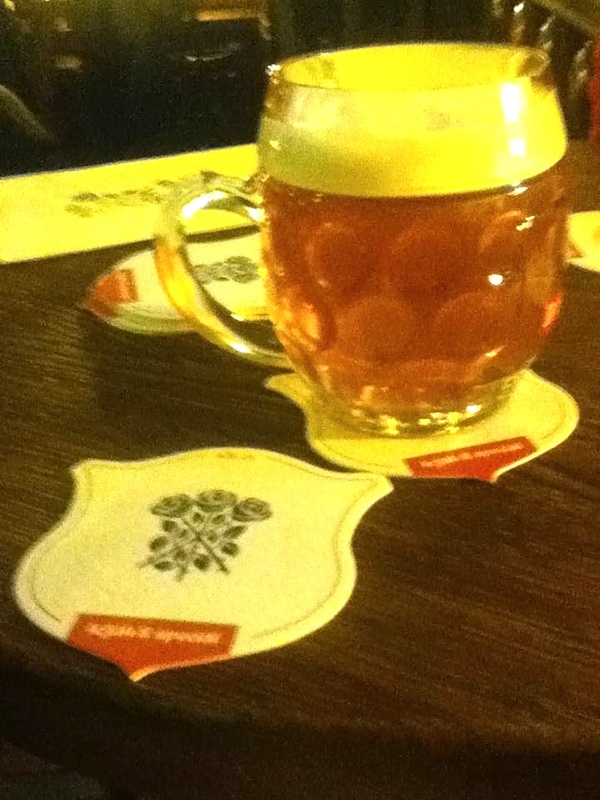 Wayward Wine’s adventures through Prague’s drinks continues next Monday. See you then.